Do you want to have the best holiday party or event this year? Well, the first thing you need is good planning and great organization skills. The Holiday Event Guest List is the best tool to use over the holidays if you want to have a meticulously thought-out celebration that will be remembered for years to come. This template makes planning an event easy and effortless. Simply go through the document and fill in the blank spaces with the corresponding information, it’s that easy! Now you can take control of the holiday season and amaze your friends and family at the same time; download this free template to get started! You can download this template for free by clicking on the link provided at the bottom of this page. Doing this will automatically download the document to your computer! Now that the hard part is over, let’s move on to the template. You will begin editing your document by listing all the names of the people you want to invite in the far left column of the document. The space next to the name is where you can enter an item that you want that person to bring. This will make buying food and drinks manageable, especially for a larger group of people. You can also enter their address, relationship to you, whether they are bringing more people if they have received your invitation if they accepted the invite and if they have accepted or declined to bring food. The last column is a space for you to list the time they will be attending. This will help you know when people, who are bringing key items, care going to arrive for your event. By having this information readily available, you will be able to plan the elements of your party accordingly and time every aspect to perfection! 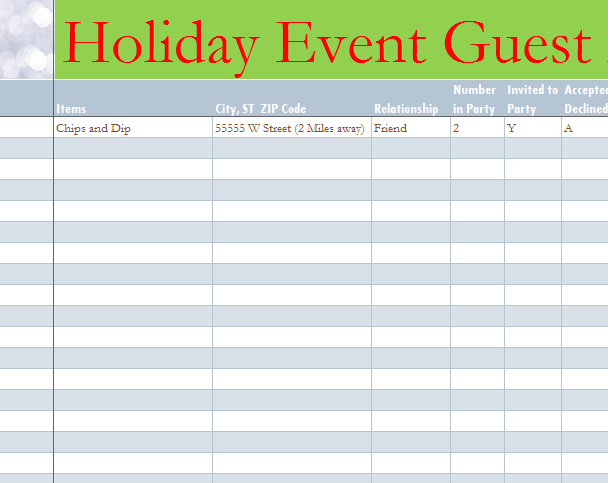 Organize your holiday event with this simple Guest List!